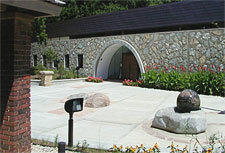 The Holliday Park Nature Center provides a unique venue for corporate retreats, birthday parties, family reunions and more! Each of our comfortable spaces offers a spectacular setting within the wooded landscape of this natural oasis. Host your next event with us and discover why people feel they have left the city while visiting Holliday Park. Please call (317) 327-7180 with questions or to schedule a rental. The facility is available for rent between 9 a.m. and 5 p.m. Monday through Saturday and between 1 p.m. and 5 p.m. on Sunday, based upon availability. Setup and cleanup must be included in rental time. There is a two-hour minimum on all rentals. 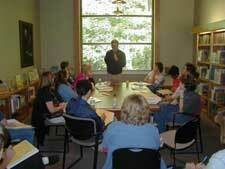 Certain equipment (tables, chairs, audio-visual) is available for use. 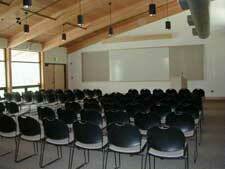 Audio-visual equipment is available only in the auditorium. Food and drink are permitted only in the classrooms. An additional fee of $60 will be charged if hiring a professional catering company. A signed rental contract is required prior to all events. Cancellation Policy: Guests must give a 14 day notice prior to the event to receive a refund minus a $20.00 cancellation charge. No refund will be given if cancellation occurs within 14 days of the event. The Holliday Park grounds are not available for rent. There are no shelters in Holliday Park and all picnic tables are available on a first-come, first-served basis.